The numbers of those living in the valleys who voted to leave the EU in the 2016 referendum took many by surprise and led to much discussion in the local and national press. Mostly due to the billions of pounds that the area has had from Europe. This is the background to the Welsh Government’s new Valleys Taskforce. The Minister for Lifelong Learning, the Cabinet Secretary for Economy and the Minister for Skills, together with a group of expert advisors, are seeking to develop a new way in which the Welsh Government can deliver change for the Valleys. The taskforce will build upon previous regeneration work in a more coordinated and targeted way to meet the needs of valley communities from Cwmbran in the east to Glynneath in the west. Since its inception in 2016 the taskforce has been consulting with people living and working in the Valleys. They have spoken to over 1000 individuals and through social media have engaged with a further 7000 people. This engagement programme has led to the development of the high level plan “Our Valleys, Our Future”, published July 2017 and version 1 of the detailed delivery plan, published November 2017. The employment gap between the South Wales Valleys and the rest of Wales will be closed. This means helping an extra 7,000 people into fair work and that thousands of new, fair, secure and sustainable jobs will be created in the Valleys. Public services will be working with the third sector and local communities to respond to people’s needs. Improved education outcomes for all children and close the attainment gap. A Valleys Landscape Park will have been set up to help local communities celebrate and maximise the use of the natural resources and heritage. The Valleys will be a recognised tourist destination, attracting visitors from across the UK and beyond. Sitting under these three priorities are 68 actions, and 46 wellbeing indicators that will help to measure success. The success of Our Valleys Our Future relies on collaborative working between communities, government departments, European funded projects and the private sector. The taskforce will work alongside the Cardiff and Swansea city region projects. 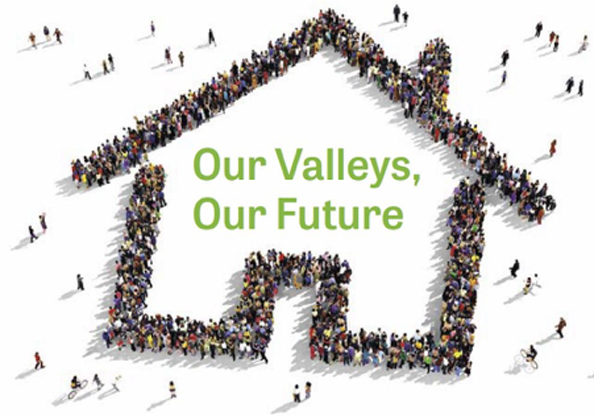 The taskforce is focused now on putting plans in place to achieve the actions set out and ensuring that it continues to engage – both with the population of the Valleys and the key stakeholders who can influence the positive results that they are working towards. For more information on how to link into the developments visit the Welsh Government’s pages, follow #talkvalleys on Twitter or contact them directly through their Facebook page or email at talkvalleys@wales.gsi.gov.uk.